I got a little surprise in the mail today from Delta Air Lines and at first I thought it was one of those postcards some companies mail you when you haven't been using their product or service in a very long time. I have not flown Delta this year so consequently my Medallion Qualification Miles (MQM), -Segments (MQS) and -Dollars (MQD) are all zeroes. It was either that or perhaps a reminder notification that my Delta Companion Certificate is expiring in a few months. It was much better! If you are a Skymiles member, you probably also got the same surprise as me not to mention the title of this post pretty much gave it away. Delta is offering the exclusive benefits of the Gold Medallion status and Delta Sky Club membership for the next two months. To accept this offer, you must activate by October 15, 2015 at: delta.com/unlockgold Only members who receive this communication directly from Delta Air Lines are eligible to participate in this offer. 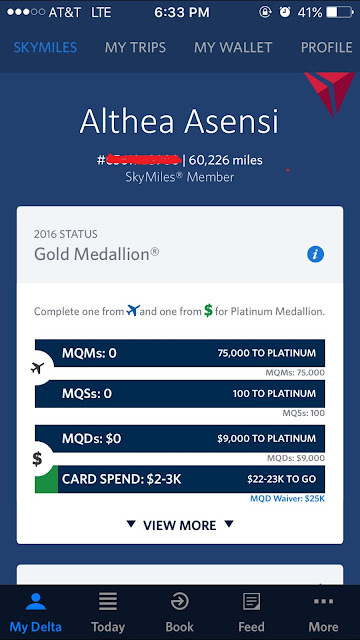 After registering your Skymiles number, your 2016 Status will automatically update and you can easily check this if you have the Delta app for your phone or tablet, or you could also go to Delta's website to check your Skymiles status. The Gold Medallion is the next status after Silver but before Platinum and Diamond. It is easier to reach Silver Medallion Status. You need to fly at least 25,000 MQMs or 30 MQSs, and spend $3,000 MQDs. There is probably a lot of Silver Medallion members competing for the unlimited complimentary upgrade to first/business class. To reach Gold, you will have to fly twice as much and spend twice as much. But on the bright side, it is most likely that only a few Gold Medallion members are on your flight segment unless you are flying in and out of major hubs. The higher your Medallion status, the more likely you would get upgraded. If your flight have multiple segments (flight numbers), you could get upgraded for each segment. Another benefit of Gold Medallion is the Sky Priority check in, boarding and expedited baggage handling. To view all the Medallion benefits, visit Delta's website here. The annual membership fee for the Delta Sky Club starts at $450. But you don't have to spend that much if you are not a frequent traveler by purchasing a One-Day Pass instead. The perks include complimentary wi-fi, satellite TV, food selections, wine, craft beer and spirits. They also have showers available in select locations if you want to freshen up. What if I want to keep my Gold Medallion status and Delta Sky Club Membership for a year? If you'd like to keep your status for 12 months, just register then purchase and fly one qualifying, paid Delta One transoceanic or transcontinental round-trip flight within two months of registration. A transcontinental flight is defined as a nonstop flight between New York (JFK) and Los Angeles (LAX) or San Francisco (SFO) in either direction that offers Delta One service. The only eligible fare classes are J, D, C and I. Delta will also give you 15,000 bonus miles. Disclaimer: The opinions expressed on this post are the author's alone and have not been reviewed, approved, or otherwise endorsed by the company(s). © 2014-2015 The Traveling Dyosa All rights reserved.